Now that I don't have a "regular job" anymore, I've converted part of my home to an office. I have a computer, printer, and most of the necessities to carry out my freelance work. But one thing I really miss from my previous life as a full-time employee is a photocopier. I could go out and spend the money for an all-in-one printer/photocopier. But quite frankly, I probably should pay the property taxes first. So I've cobbled together a "photocopier for the unemployed," and I thought you might be interested in how this works. I decided to use an old Mac laptop that wasn't seeing much action these days as my scanning workstation. It had Photoshop Elements 4 loaded on it, and the application accepted the ancient Canon driver. So I made a little extra room in my home office, set up the laptop, plugged in the scanner, and fired everything up. Surprisingly, it worked! I used a bank document for the test because it had lots of small writing and fine lines. I set the software to scan at 300 dpi for an 8.5"x11" document. I used the black & white setting to keep the file size small and scanning time to a minimum. I then made a scan and the image appeared in Photoshop Elements. I simply hit "Print" and was soon greeted with a decent reproduction of the original document. I decided to keep an electronic version also for my records, so I converted the Bitmap image to Grayscale and saved it as a Jpeg at "10" quality. The file size was a little less than 1MB, and I printed it too as part of the test. It looked great. With a little practice, I was able to produce a "photocopy" within a couple of minutes. And since I have more time than money, this seemed like a good alternative to a dedicated photocopier. Plus, now I can scan other stuff too! 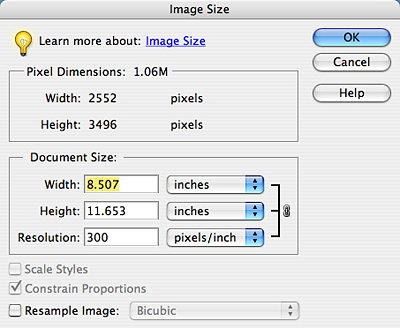 Note: To make sure your output looks good, open the Image Size dialog box in Photoshop, uncheck the "Resample Image" box, and change the resolution to 300. Your "photocopy" will look great. Derrick, why don't you create them as PDFs instead of " I decided to keep an electronic version also for my records, so I converted the Bitmap image to Grayscale and saved it as a Jpeg at "10" quality." the create PDF is right there in the print dialog and makes perfect copies if you ask me. 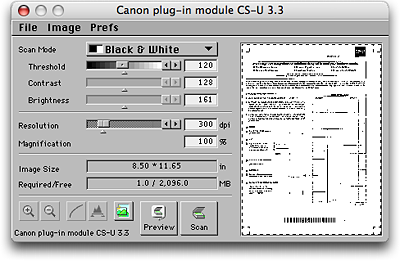 Hi Derrick, I have an old Canon LIDE scanner, and it's OSX drivers include a "copy" function inside "CanoScan Toolbox" as well as scan to PDF, Print, scan to a specific app (Preview works well). and makes life much easier, sure, i still wish i had a real copier at times, especially for multiple page copies, but it works a treat. Hopefully they have a version of the software for your scanner that will do the same, so you can avoid the "middle man" applications. Yeah, PDFs are a great way to go, and as you mentioned Mitch. I do like the idea of having an electronic version. Most of the time, when I need copies, they are for other people. I don't like to keep paper unless I have to. So scanning fits so well into that scenario. If you buy a copy of Vuescan from Hamrick Software you can use your scanner and printer as a photocopier. Vuescan supports many old scanners, including your Cannon FB630U. You can download the full version to try out (with a watermark on the scans) before you buy it. Vuescan supports color profiling of scanners and printers (when used with calibrated targets), works on Mac OS, Linux & MS Windows, supports a huge number of different flatbed and film scanners, and is constantly being improved. Thanks for the article. this was just the thing I needed to see. WOW :) It's so sad more folks don't know about this place, this article had just the thing I needed today.